Over the summer 2017 we took a moment to reflect on the amazing time we have had as a partnership, helping London schools to grow food. Research teams from the University of the West England (Bristol) and Cardiff University, carried out an independent FGSL project evaluation. You can read more about our achievements in our special report launched at City Hall in October 2016: FGSL Interim Report (October 2016). An independent project evaluation by University of the West England, summarising the progress of the programme in its third year. James Campbell, Chief Executive, Garden Organic said: “I am deeply proud of what we have achieved so far — 87% of London schools* are now growing food and considerably more pupils, parents, community members and businesses are involved ". Thank you to everyone who has helped us achieve so much since 2013 - from teachers, volunteers and local businesses, to FGSL staff and funders - to name but a few. Without you none of this would have been possible. A huge thanks also goes to our fantastic FGSL Partners, who are busy every day sharing their expertise with schools. 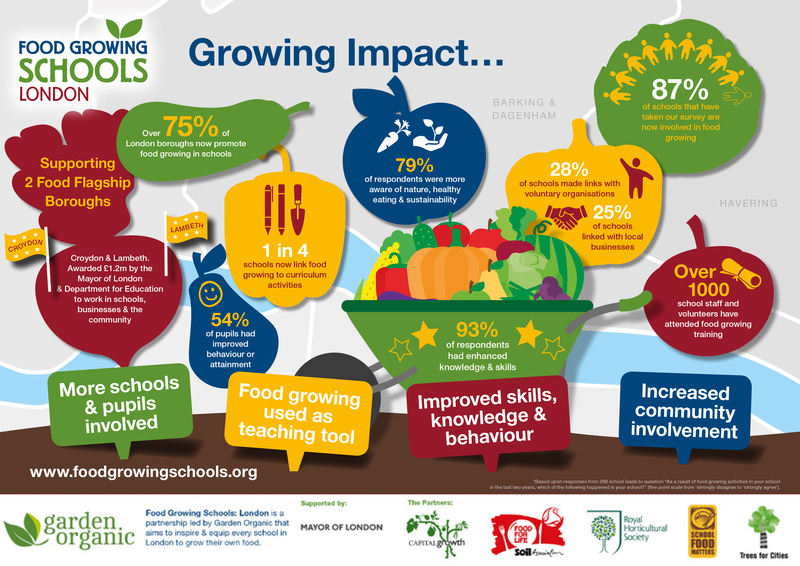 Together, we have discovered the huge benefits of growing food in schools - improving young people's education, health, the environment, the local economy and the impact on the local community. It's vital now that we all continue to work together to help young people in our schools keep growing and flourishing. We think this is all pretty exciting but the undeniable benefits of food growing mean we’re keener than ever to improve on our achievements to date. We want to reach every London school and as many pupils as possible, and we want food growing to be more deeply embedded within schools. We have the help of our wonderful partners but the Food Growing Schools: London project is due to end in July 2018. We are looking for funding and support to continue to make an impact in schools across London, so if you can help us to reach our goals please contact the FGSL team fgslondon@gardenorganic.org.uk. Food Growing Schools: London - Sowing Ideas. Growing Inspiration. Cultivating Futures.